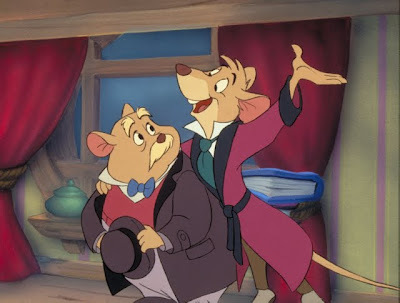 Regardless of the fact that I couldn't see a distinctive visual difference in this still murkily lit and darkly drawn remastered and restored version of The Great Mouse Detective, nonetheless the intelligence of the Sherlock Holmes inspired plotline -- based on the children's book Basil of Baker Street by Eve Titus -- continues to impress twenty-four years after its 1986 release. 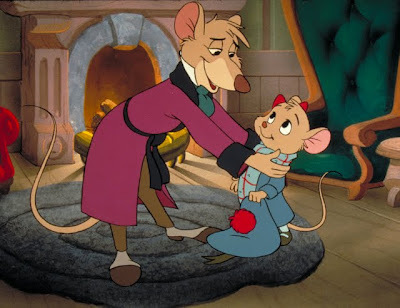 The second film to use then-groundbreaking CG technology (following the poorly received failure of The Black Cauldron), Great Mouse is a watershed Disney movie for a number of reasons. Not only did it pave the way for the increasingly vivacious animation in the era of computers but it also marked the directorial debuts of two of the movie's four men at the helm – Ron Clements and John Musker – who went onto breathe newfound life into the studio by diving deep under the sea for The Little Mermaid which solidified the Dinsey animation reputation after a few rocky years. 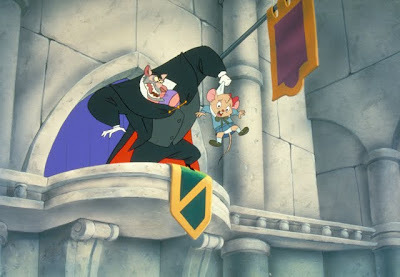 And surely, the critically acclaimed Mouse Detective was a major building block in the next wave of the House of Mouse, despite the unfortunate timing that found this ingeniously imaginative Holmesian tale set in Victorian England battling box office business with 1986's fourth quarter "mouse" smash An American Tale from a rival studio. 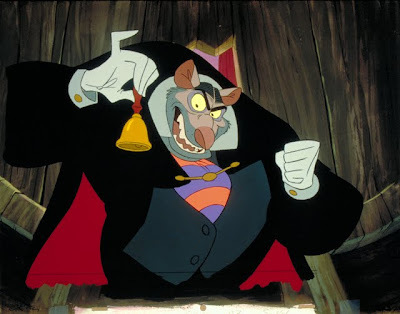 Yet, while Tale still remains one of this reviewer's favorite '80s children's works as one of the earliest movies I remember seeing, I was thrilled to discover just how involved I became in Disney's celebration of the greatest mouse investigator working in England in 1897, in the form of Basil Rathbone (named for one of the most beloved actors who brought Holmes to life). 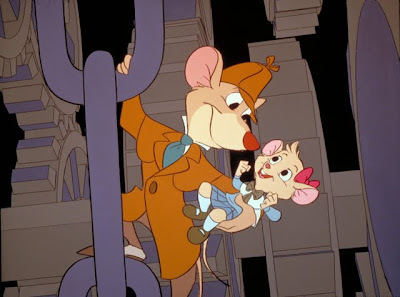 Changing the names of Arthur Conan Doyle's characters to ones that either rhyme or swap a letter or two finding his sidekick Watson becoming Dawson and the housekeeper Hudson turning into Judson, the film begins on a rather intense note that may scare its youngest viewers as the toymaker father of a young female mouse named Olivia is abducted while celebrating her birthday. Captured by villains, the father is quickly put to work as part of a nefarious plot to try and seize control of London from the Queen of Mice by Basil's arch-enemy, the devilish and diabolical Dr. Rattigan. And when Dawson happens upon Olivia hiding in the rain, he agrees to help her find Basil of Baker Street, who incidentally lives at rodent level in the same building occupied by the real violin playing, deerstalker hat wearing Holmes. 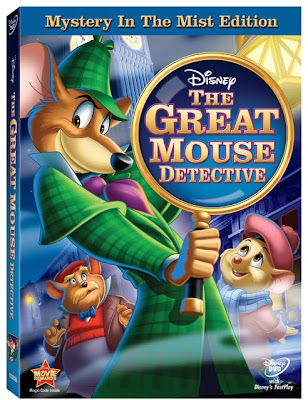 Filled with action, The Great Mouse Detective proved to be a wise decision by Disney to take a break from the business of princesses, appeal to both genders and opt for something that was edgy as well as adorable, which was in stark contrast to some of their slower paced cute-as-a-button family hand-drawn features like Fox and the Hound. Making the most of the studio's penchant for animals by serving up another terrifying cat and a friendly dog, the movie makes you quickly forget you're watching rodents throughout by emphasizing plot and character, which Clements and Musker unfortunately did not do in their latest effort, The Princess and the Frog. 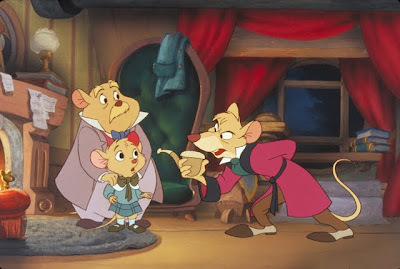 With a story strong enough to make up for the less than stellar transfer of the movie (on par with the dated look of last year's Oliver and Company re-release), The Great Mouse Detective is nonetheless still highly recommended intelligent fare. Likewise it is sure to appeal to adults and children alike, especially if like this reviewer, you watch it in quick succession following another recent release of Guy Ritchie's Warner Brothers release, Sherlock Holmes.